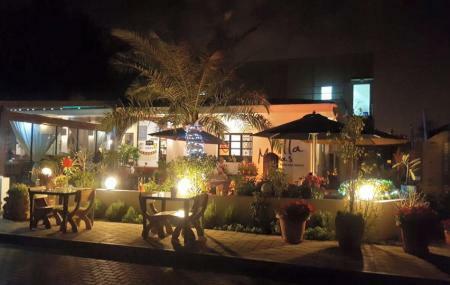 Villa Mamas in Saar, Complex Bahrain has a lovely atmosphere. With really good food on offer, people do not get disappointed by visiting. Their food is a little pricey, but they are one of the best who serves 'fancy' traditional food. Try the Quinoa Salad and the Chicken Tahchinalon with the Tangy Nutty Chicken. With high flavour and texture, the saffron ice cream is a special dish as well. Pay them a visit to satisfy your taste buds. Find the joy in planning a D.I.Y. trip by using this awesome Al Markh trip planner. You can add cozy hotels in Al Markh like Gulf Court Hotel, Al Raya Suites and Mercure Grand Hotel Seef / All Suites. Curated Al Markh vacation packages await! Book the best ones and start turning your dream into reality.Discover various ways for how to reach Al Markh and complete the booking by choosing your mode of transport. Love this? Explore the entire list of places to visit in Al Markh before you plan your trip. Fancy a good night's sleep after a tiring day? Check out where to stay in Al Markh and book an accommodation of your choice. The salad is extremely fresh and the restaurant is clean. The olive oil and side seasonings are high quality and they are available for purchase in the store. But they are expensive, and I do not find a justification for the price. The food portion is good. The lamb shank is good for two people. The prices however, are very high. Most probably, if you are not from the area, you will be intending to get to there which is another reason to expect lower price. The atmosphere is nice in itself, but irrelevant to the food served and the cuisine. The good: Speechless , nice place mixed between a restaurant and food supplies shop with country style furniture. The dishes are super delicious with good variety , they provide traditional Arabian gulf food in modern concept. (Lamb shank is the best dish in my opinion) The bad: The restaurant is too expensive even more expensive than 5 star hotel restaurants , and in a zigzag hardly to get location. Very bad customer service. Food is expansive and nothing special. I went there to test the food. I selected from business menu and they told me I can't share tjis food with my partner. There’s a reason people come to this restaurant from all over the GCC. This is my go to place to take clients and guests, authentic local food with an excellent atmosphere and extremely family friendly with no alcohol in the area which is a big plus for many Arabs. Although a little pricey, I believe it is justified by the taste and experience the restaurant offers.